Ben Morris, Yordan Sinapov and David Squire are looking ahead to careers in nursing following their studies with the University of Plymouth. What inspired them to take up nursing? Why was Plymouth the right choice? And what are their ambitions for the future? 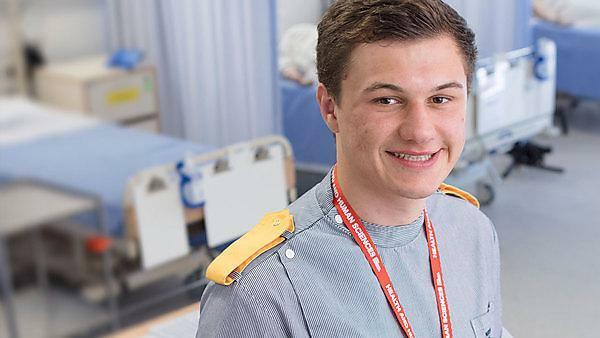 "I chose to go into nursing because I have seen the inspirational impact they have. I saw this first hand with a close friend of mine when I was younger. And when I looked into it, I found how much of a rewarding degree and job it would be." "The placement side of the course means you can practise all you learn in theory, which is great. The theory side of my course is interesting because it makes sense of what you see in practice and why certain things take place. We also have clinical skills, which is great safe environment to practise and be given live constructive comments on my work. "My advice to fellow male nurses? Go for it! I am the only man on my course and have been the only male nurse in the department for every placement. I love this degree and job I have chosen. The opportunities for men in nursing is ever increasing! I feel strongly that have a multi-gender nursing team can give the highest quality care to patients." "Years ago, my mother had a brain surgery. After the surgery she had to stay in a hospital to recover. It was very difficult time for my mother and my family. We were not able to be with her and support her all the time as we still had to go to work. However, I still remember the nurse looking after my mother and the way she cared for her and helped the whole family to get through this difficult period. "She was knowledgeable, carrying and very professional. She clearly cared for my mum and made her recovery much more pleasant. Every time when I had to leave my mum and go to work I knew that she will be looked after somebody that care for her and she will have the holistic care that she needed. I always wanted to be like the nurse looking after my mother." "Plymouth is an amazing place. It is close to the beautiful beaches of Cornwall and close to the many of Devon’s attractions. I also chose Plymouth based on the experience of some of my friends, who were already students here. I'm equally impressed by the support received from the University as well as the tutors. "Regardless of how much I have already done at Plymouth, there is still a lot to be learned. It is never boring, and the teaching sessions and exams are well organised, so I can have enough time to prepare for exams. It can be challenging at times. Placements can really test your time management skills. But, somehow at the end of the day, all you feel is the satisfaction that you are one step closer to that moment when you will be a qualified nurse, and you will be able to deliver person-centred holistic care." "Nursing is not a career, it becomes your life. It is not a male or female profession, it is for everyone. You will be able to help people that need it and the feeling after that is amazing. "I have changed a lot since I started the course, and I definitely can say that nursing made me a better human. It is worth it." "I did a bit of nursing a long time ago and wanted to get closer to the care and therapeutics side of things. I want to progress things further and achieve a professional qualification."